Short-term housing and care for the treatment of those with mental illness is provided in two buildings, each serving 16 clients and staff. Client and staff safety while maintaining a homelike environment was a key challenge. A wooded, sloping site with wonderful mountain views and southern sun was selected. City of Littleton Comprehensive Plan required a rural vernacular architectural vocabulary for this location. The two buildings form an entry forecourt and open to the south and west with terraces and courtyards. The Santa Fe House’s form is inspired by classic farmhouses, while the larger Bridge House is designed as if a collection of rural buildings. Both have front porches, dormers, prominent rooflines, and stone bases. 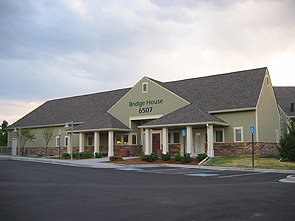 The Bridge House, serving a more intense clientele, is designed to unobtrusively optimize observability from the central nurse station.